This patient had severe crowding in the upper jaw. The crowding was so severe that there was almost no room for her upper canine teeth, resulting in these teeth erupting in front of her other teeth. She called these her “vampire fangs.” In this particular case, sufficient room was created without removing any adult teeth. This resulted in a brilliant full smile and bite that balanced perfectly with the patients facial features. Please note, this patient benefited without taking any teeth out. However, this is not always the case. Every patient needs to be assessed fully and treated according to not only their bite and crowded teeth, but to their face and what will give the best result at the end of treatment. When assessing a patient for orthodontic treatment, the whole face is evaluated not just the teeth. Sometimes straightening crooked teeth can be achieved with braces alone to produce an amazing smile. However, in some instances, the severity of the tooth crowding combined with the facial profile may warrant removal of some teeth so a protrusive face and lips does not result at the end of treatment. The number and location of any tooth extractions is assessed very carefully to ensure it will result in a balanced smile that’s in harmony with the patients face. This patient had crowding of her upper and lower teeth, some crossbites of the front teeth and a shift of the upper front teeth to the left. All this combined with protrusive front teeth meant some adult teeth were removed prior to braces being placed. Less than 18 months later the patient has a healthy smile she is extremely happy with. Orthodontic treatment isn’t just for children. Adults of all ages can have orthodontic treatment to create the beautiful smile they have long hoped for. Sometimes, however, adults can present with extra complications as a result of years of dental wear and fillings. This lady presented with a recently removed upper right tooth that had split in half and could not be saved. Instead of undergoing costly treatment to replace the missing tooth, her general dentist realised the benefit of orthodontic treatment to address the missing tooth and improve her smile. Due to the amount of tooth crowding present, and already extracted upper right tooth, one more tooth was removed on the upper left only to help balance the smile. The result after 16 months of braces was a beautiful, healthy smile with straight teeth and an even overbite which will now help reduce the risk of future tooth wear. Orthodontic treatment can address all sorts of dental problems, from complex bite problems to simple alignment of some crooked front teeth. It probably isn’t anywhere near as uncomfortable or time consuming as you may envision. Most teeth will look significantly straighter in 3 to 6 months. However, orthodontic treatment normally takes longer to ensure the teeth fit together in a harmonious bite. Remember, a great smile is more than just straight teeth! 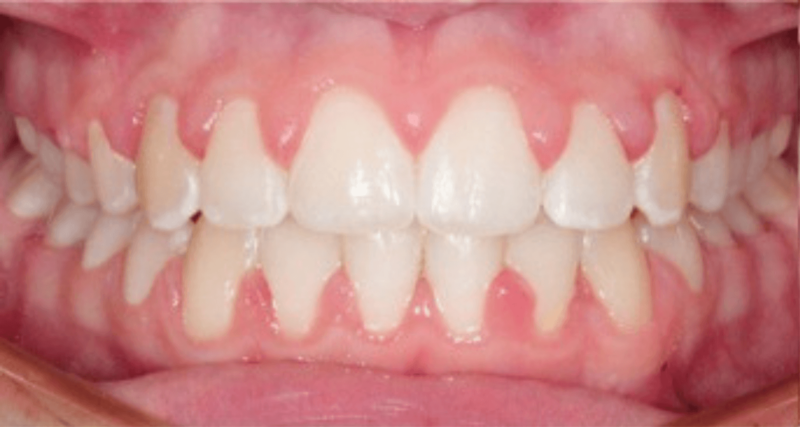 For cases such as this young man who has crooked front teeth and an increased overbite, braces were on for less than a year.